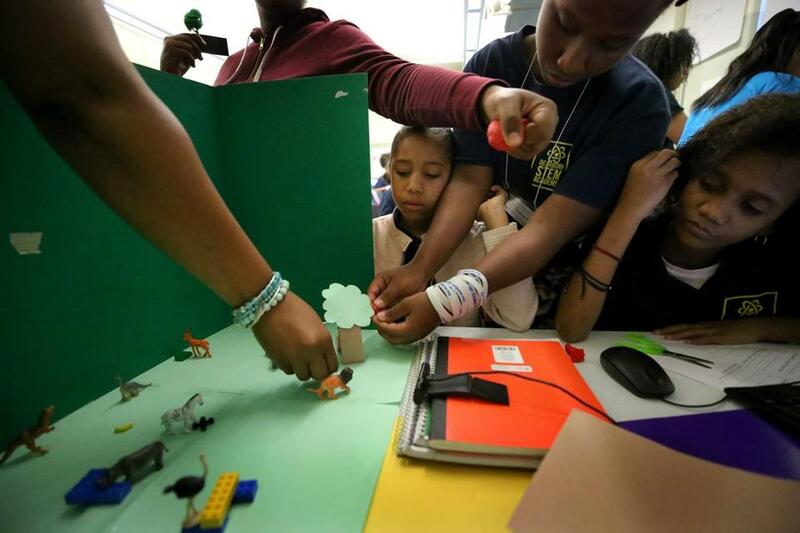 Massuira Teixeira, scrunched in the middle, worked on a 3-D printing and computer animation project with Joelma Goncalves and Ludience Depina at a summer learning program run by Empow at The Dearborn STEM Academy. Over the past four weeks, 10-year-old Polo Brice has boarded two buses in the morning to go from Hyde Park to a small wilderness area about 30 minutes away in Westwood. At Hale Reservation, he has caught a small fish in Noanet Pond (and thrown it back), shot arrows, and navigated a ropes course. In between those activities, Polo has gathered with his classmates under a wooden awning for lessons in math and reading. Polo is among more than 10,000 Boston students taking part in a revamped approach to summer learning that blends academics with other enrichment activities, such as fishing or dancing, in an effort to increase their achievement and help mold them into well-rounded individuals. The program, which is free, aims to tackle an often-overlooked inequity that emerges every summer: Some families have the means to spend thousands of dollars on academic boot camps and enrichment activities, while other families do not, setting their children behind. A growing body of research indicates that gaps in academic achievement can widen between students simply because some have had the quintessential summer camp experience — or several of them squeezed into the two-month break — while others have been stuck in front of a TV or computer. Even summer programs that focus just on fun stuff can give the suburban kids an edge over low-income kids who don’t take part — teaching them skills such as teamwork or creative thinking. At a time when many schools are under pressure to boost achievement, school systems are increasingly rethinking their approach to summer school. Their goal is for students to return to school in the fall ready to pick up where they left off so their teachers won’t have to reteach lessons from the previous year. In Boston, the program Polo Brice is attending is part of an effort called the “5th Quarter of Learning,” a nod to the belief that most students need to build upon or reinforce the knowledge they gained during the four academic quarters in the regular school year. It is an ambitious effort. The estimated 12,000 students taking part in summer programs run by the school system — with the help of more than 100 nonprofits — represent about half of the children who could benefit from them, according to Chris Smith, executive director of Boston After School & Beyond, a nonprofit helping the school system reshape such programs. Additionally, a bill pending on Beacon Hill would provide Boston and other school systems with additional funding to overhaul and expand summer learning. “We have woken up and realized we can’t do it all in 180 days,” said Matt Malone, a former state education secretary who is now superintendent in Fall River. Malone said he would like to serve 2,000 or 3,000 students in Fall River during the summer instead of a few hundred, but the learning model is expensive. While the so-called summer learning slide can affect students of any income bracket, it is low-income students who on average forget more of what they learned because they have fewer opportunities for stimulating activities. A 2007 study by a team of researchers from Johns Hopkins University, who traced the academic performance of hundreds of Baltimore students, found that by the ninth grade, more than half of the achievement gap between low-income students and their more affluent peers was because of the vast differences in summer experiences. In Massachusetts, families who pay for summer programs on average spend $475 a week, according to a survey in 2014 conducted by the Afterschool Alliance, a national nonprofit. Statistics like that have resonated with schools such as the Haynes Early Education Center in Roxbury. Teachers and administrators noticed that some kindergarten students were enrolling without any preschool experience, and a survey of parents last year revealed that many of them were having difficulty finding affordable summer programs. So this summer, Haynes launched a summer program in partnership with the New England Aquarium that served about 50 incoming kindergarten students and a handful of rising first-graders. The students got to know the rules of school, such as raising your hand, and learned about the alphabet, often while studying the ocean. Dearborn STEM Academy in Dorchester has set a goal of trying to connect every student with a summer job or learning opportunity. A survey last fall revealed almost half of the 160 students in grades six to eight had not attended a summer program that year, including three-quarters of sixth-graders. The Dearborn brought in Empow Studios, an engineering and technology enrichment program based in Lexington, to teach computer animation, robotics, and three-dimensional printing to students who recently emigrated from Cape Verde. The program, which would cost $595 a week in the suburbs, is free to Dearborn students. “At first I was skeptical if the students could do the program because of the language barrier, but I’m pleased with what they are learning,” said Mina Depina, the school’s guidance counselor who oversees the program and was born in Cape Verde. One morning over the rumbling of a decades-old air conditioning system, about two dozen students fine-tuned designs for key chains. He said he wanted to stay home and play video games, but then he got the chance to design his own video games. Attendance in the Boston summer programs has averaged 84 percent daily. Officials believe, based on a study of their five-week programs by the nonprofit research firm RAND, that students who attend at least 80 percent of the days do better during the regular school year than those who do not participate. One of the most popular programs has been at Babson College’s campus in downtown Boston, where two dozen Boston high school students have been exploring how entrepreneurship and technology can be used as tools for social innovation. As part of the lessons, the students, mostly recent immigrants, have been coming up with ways to address food insecurity in their communities. One group of students, for instance, created an app to help chefs find jobs and to locate new restaurants based on the demographics of the city’s neighborhoods. The program, run in partnership with Verizon and the community organizing group Sociedad Latina, has had a 100 percent attendance rate. CORRECTION: This story has been updated to correct the description of Empow Studios.